So now that you’ve got your pinterest account up and running (if you haven’t set up a pinterest account yet – here’s how to set one up), how do you make the most of it? First, we should change it over to a business account. Click the image below or the link to do it. This is very simple to do and your followers won’t know the difference. The biggest benefit for you is to be able to see analytics on your page. It’ll be under the drop down on your name at the top right. Just click the “convert” link on the page. You’ll have to fill out some business information but then you are up and running. Simple as pie. If you have a website (and you know I believe you should have a website), you’ll need to verify it. Depending on your website, this could be a little more complicated. I have a wordpress website so it was as easy as adding a trusted plugin and the code. You’ll want to add the “Pinterest Follow Badge”. I added it to my blog that if people roll over an image. 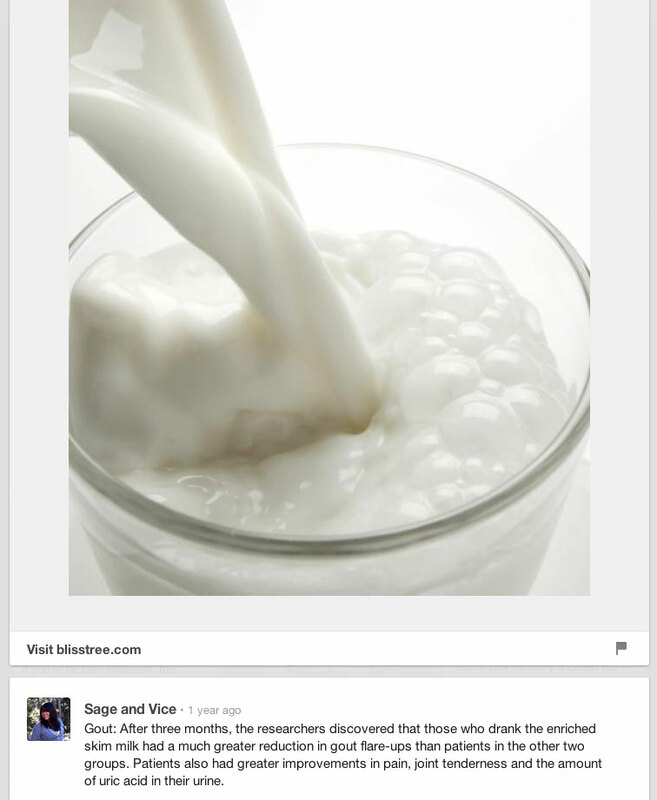 I also added a plugin for Rollover on Images so people can easily pin them to pinterest. 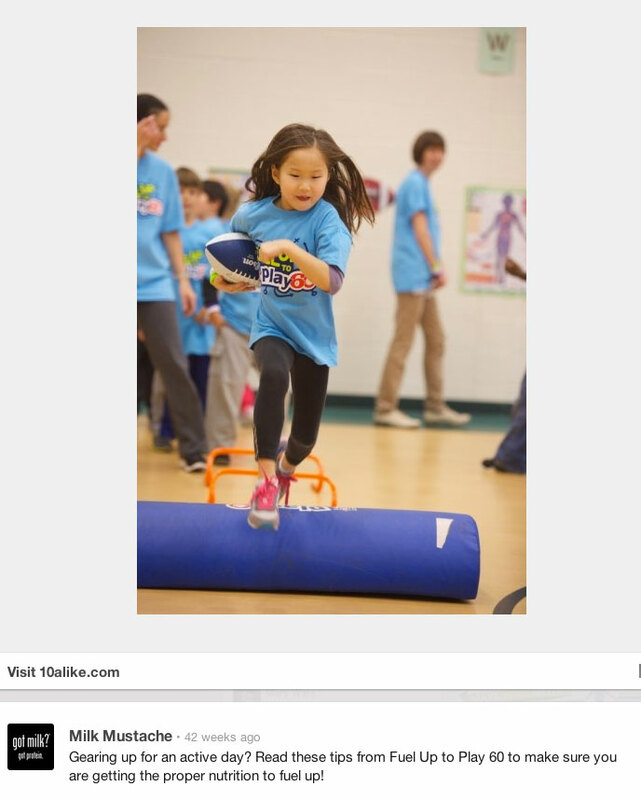 Below is a sample of how the rollover looks when people touch an image with their pointer. But when it comes to using Pinterest strategically, you need to have a plan in place. So what’s the first thing you need to do? 1. Make sure you are pinning what your customers want. When it comes to dairy, there are several interests from consumers. 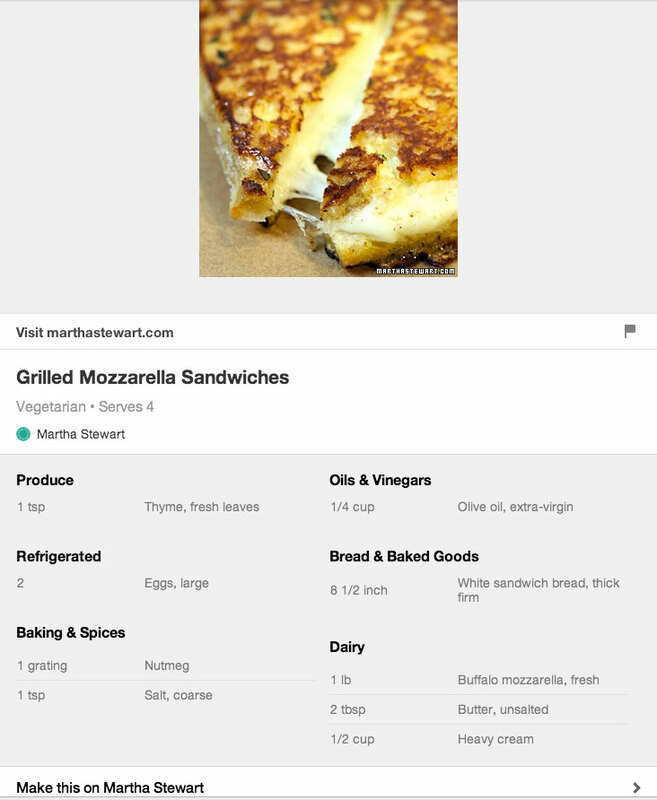 TIP – Rich Pins offer more information (like the recipe information above) for your pins but also require some work by your web developer. Here’s more information on rich pins via social media examiner. People really love to see what happens on a farm (this is Brenda Hastings farm and she does a great job with pinning about the farm) – they love cows and the barns. You can give them what they desire by pinning the photos you take of the landscape and the animals. TIP – Make sure that you are posting these photos to your website first – and not just straight into Pinterest. You want the photos on your website so you can drive traffic there. And it will also keep you safe if Pinterest decides to change how their system works. 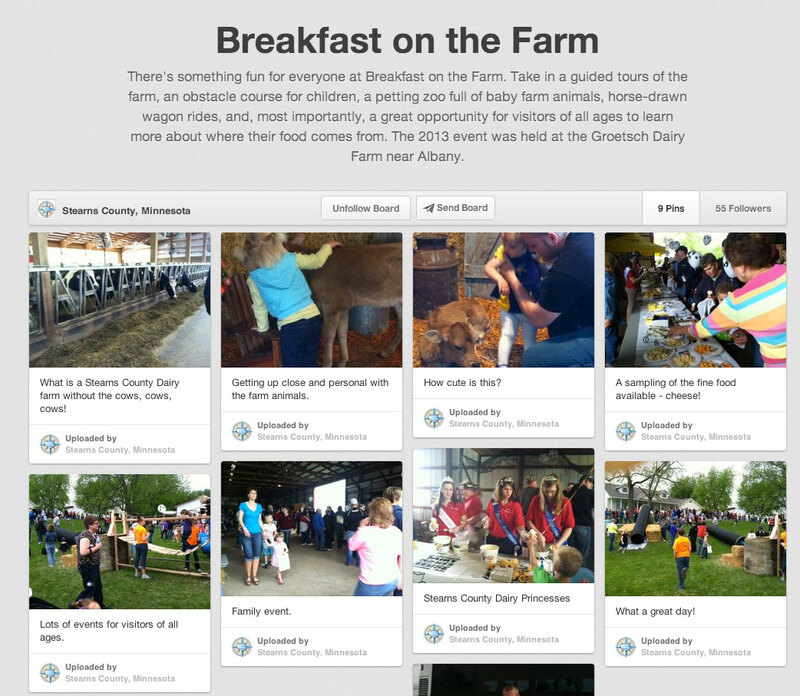 People love farm tours and to visit virtually 24/7 is not a bad thing. You’ve given probably hundreds of tours but if your tour lives in the digital space you may be giving tours to hundreds of thousands of people from all over the world. Not just the people that can make the drive to your place. Sterns County, Minnesota did a great job here with this farm tour of Groetsch Dairy Farm near Albany. Pinterest is a very useful search engine when it comes to practical advice and partnering that information with pictures and links back to your website can really generate a lot of repins, comments and likes. Check out this one on Gout. There are many things that just aren’t communicated about the farm, your animals or your products. Here’s an opportunity to get out quick facts along with great photos or infographics. And they don’t all have to be serious – Hiland Dairy is showing humor, fun factoids and animal care. While videos aren’t very new to pinterest, they definitely aren’t posted as much as other content. I would recommend posting more video if you can since it generates more repins, likes and comments because it is more of a novelty. 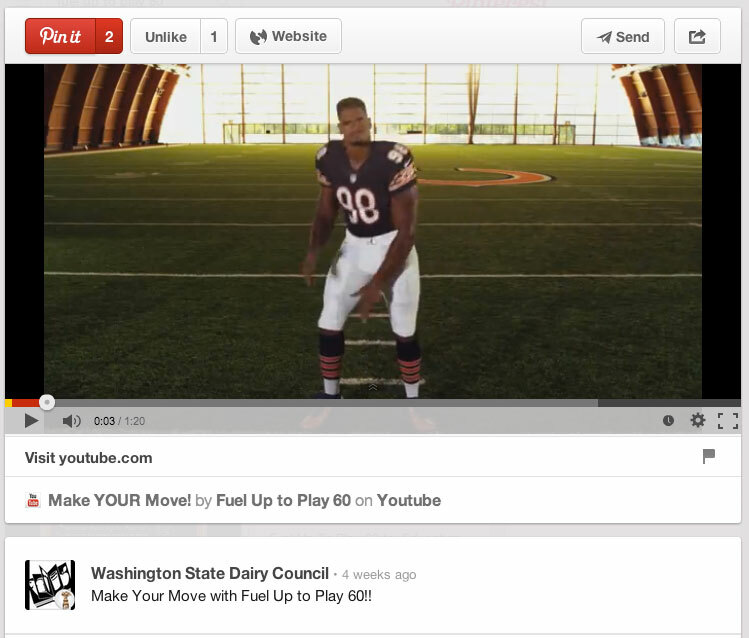 Washington State Dairy Council was passing along a YouTube video of our Fuel Up to Play 60 Program for kids. Pinterest is definitely a social network where people are looking to be inspired from the things they want to have like clothes and houses to the things they want to do like exercise and eat right. 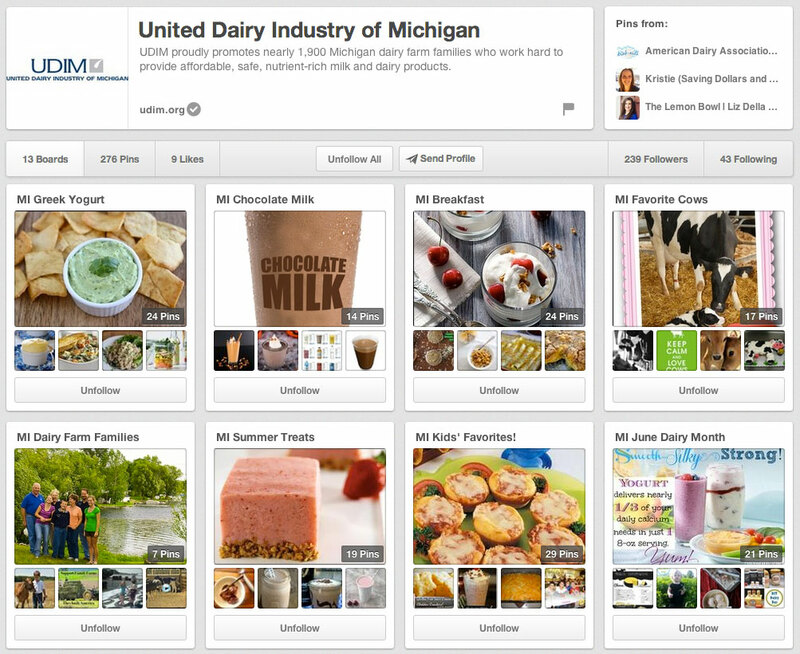 Since dairy is part of a healthy diet and the Fuel Up to Play 60 program, pinterest is a perfect fit. TIP – Images that are taller are likely to be seen more. Use good fonts when putting text on images. If you are looking for an easy-to-use image manipulator or free design program, I recommend picmonkey.com or Over App. There’s also a great design application for pinterest called Pinstamatic. You should check that out as well. 2. Keep your important boards near the top. You can easily arrange your boards in the order that makes most sense to your audience. 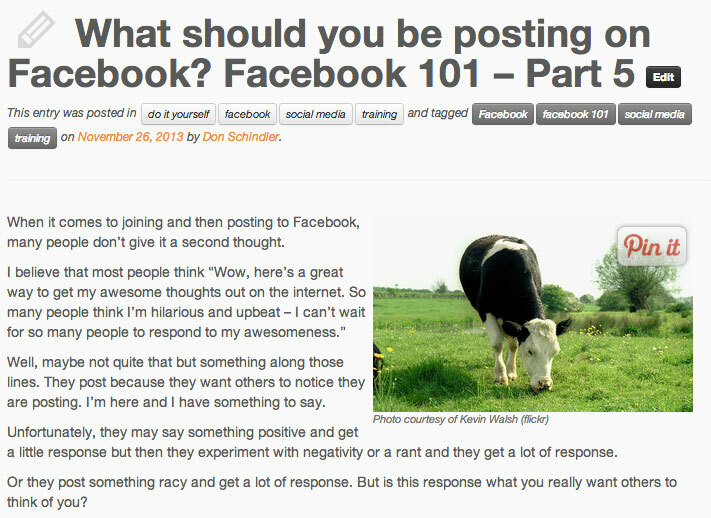 Whatever you want them to see first when they come to your page, you should put first and organize from there. BTW, when you add a board it will automatically be put at the bottom. 3. Put your pinterest link wherever you can. 4. Be careful of copyrighted images. Don’t steal. Give credit where credit is due. It’s better to create your own if you can. And if you are linking to an image on a website, make sure the source is legit. Click through the links. Bad links can damage your reputation as a trusted source. 5. Remember this is a social network. Follow other interesting users and definitely other farmers and ag supporters. Repin those your wish to influence. They will get notified if you repin, comment or like dealing on their email notifications. Here’s a list of people I follow in farming. If you want to add to it, just send it to me and I’ll add them. And here’s some great tips from ohsopinteresting. She always asks these questions before repinning. Will my followers find this pin valuable? Are my followers likely to repin this? Who am I repinning from? Could they have an interest in my business and be a potential follower? When pinning from an account with a large following how many times has it been repinned? She goes into detail on each one of these questions so I would definitely check out her blog post on this. Comment and Like other people’s pins. 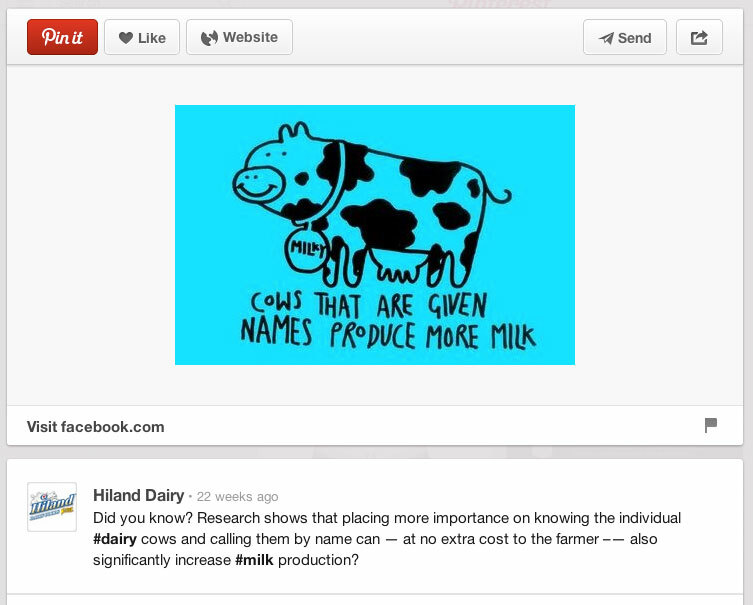 You can use usernames and hashtags when you are pinning as well to notify people of interesting pins. And, of course, don’t forget to thank them when they repin your information. 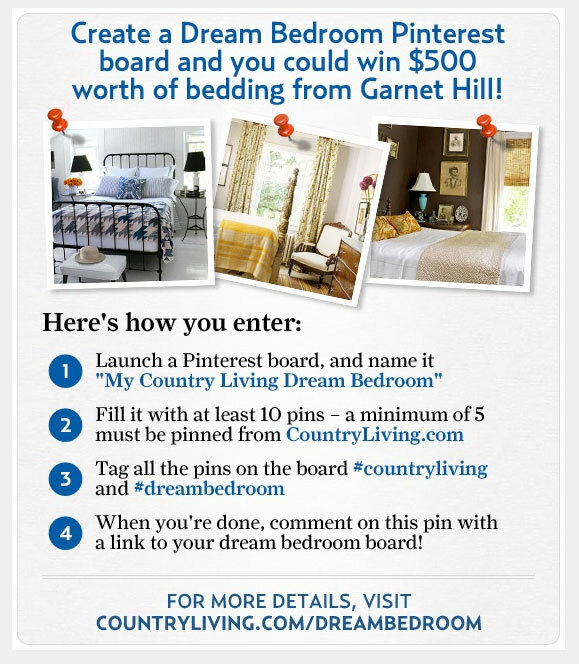 If you have something to promote, it’s really easy to use Pinterest for contests or putting in a Call to Action. 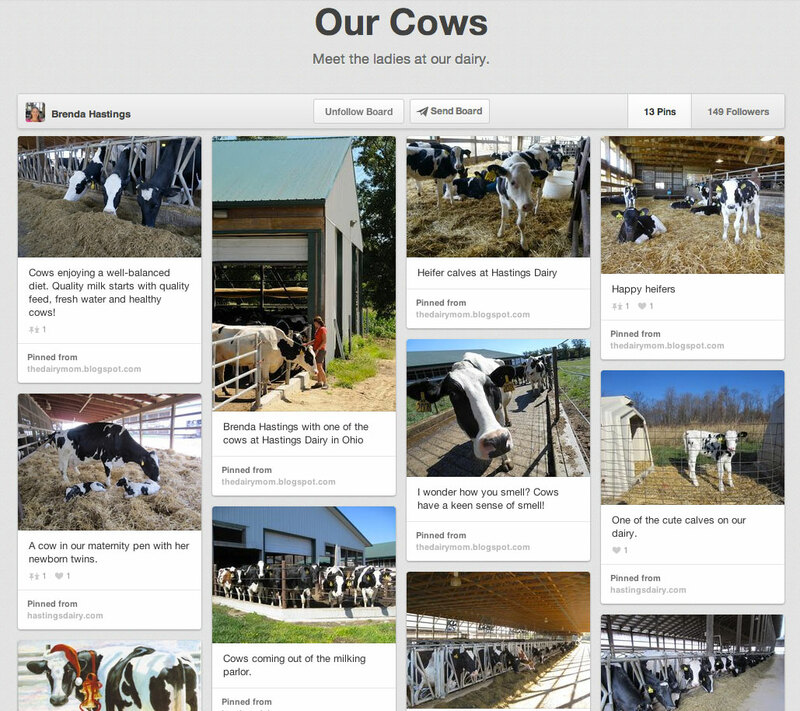 So what are your best tips for using Pinterest for your farm or business? Let me know and I’ll add them to it. If you have any more questions, feel free to reach out. Oh and I wanted to add this infographic from Amy Porterfield. You should definitely check out her blog. The 10 Commandments for Pinterest is easy to understand and looks great. Enjoy.